The Business Study Tour group from LJMU and Center for Global Engagement staff visit with Deputy Borough President Edward Burke. 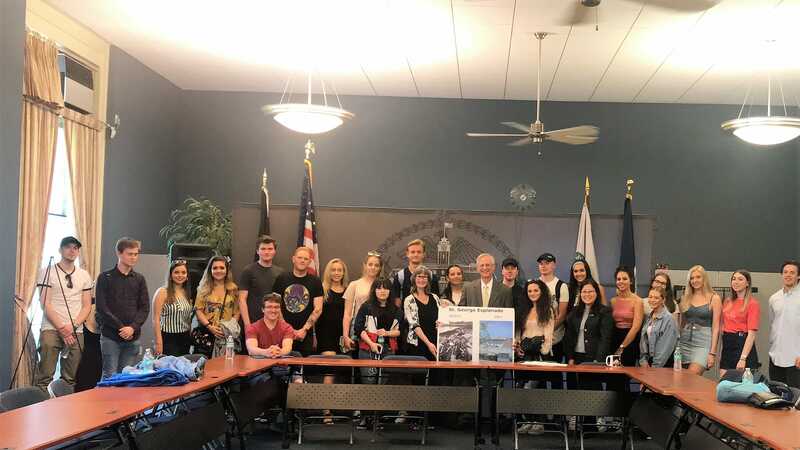 The Center for Global Engagement recently hosted a group of undergraduate students from Liverpool John Moores University (LJMU) Business School for a two-week Business Study Tour. The purpose of this visit was to offer these students exposure to the business environment and demonstrate how to conduct business in the U.S. and New York City. This tour also provided them with the benefits of studying abroad as part of their studies at LJMU. The 20 students and six chaperones received a warm welcome from Dr. Susan Holak, Founding Dean of the School of Business, and Winnie Brophy, Special Programs Coordinator for the Center for Global Engagement. The tour group was also greeted by Dr. Alan Zimmerman, Professor in the School of Business, who gave a talk on “Exporting/ Marketing to the United States.” In addition, the group heard from CSI faculty members Dr. Nancy Guo from Marketing on “New Trends and Technologies in Marketing Research,” and Dr. Chao Li from the World Languages and Literatures on “Dos and Don’ts When Doing Business in China,” and they participated in a relaxing workshop on “Careers, Interviews, Confidence! How Do I Get There?” by Neila Green, Director of Adult Education. They had fun learning unique business customs from the other side of the Atlantic. Warrick Bell, Executive Associate to the Dean, also gave them a tour to CSI’s Con Edison Trading Room where they could experience the classroom environment of the CSI Business School. In addition, the students visited the CSI Tech Incubator and attended presentations coordinated by Dean Balsamini, Director of Staten Island Small Business Development Center (SBDC); Jasmine Cardona, Director of Workforce Development and Innovation, and the CSI Tech Incubator; and business consultant Joseph Bottega. They also received a personal tour of the Staten Island Chinese Scholar’s Garden at the Snug Harbor Cultural Center from Philosophy Professor Andrew Lambert, as well as a lecture. He explained the “yin and yang” behind the design and beauty of the garden, as well as the Chinese philosophy that was employed in the Garden’s construction. 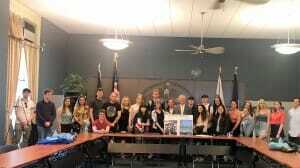 Later that week, the group visited the Staten Island Borough Hall Office and met Deputy Borough President Edward Burke, who spoke about “Staten Island Economic Initiatives Advanced in Staten Island.” He discussed the history of Staten Island, what makes it unique from the other boroughs, and how local businesses helped to develop the borough. He also took them on a personal tour to the historic St. George Theatre to meet with Vincent Inocente, Marketing Manager of the Theatre. Deputy Borough President Burke also detailed the dedication of three women, a mother and her two daughters, who saved the venue with their life savings in 2004. Inocente took them back stage to see the wall that contains signatures of famous people, such as Ringo Starr. The students were amazed by the Theatre’s incredible story. None of the students has ever previously visited Staten Island, even though some of them have been to New York. They were able to see a whole new side of New York and a view of the lives of people in this borough. They also learned about the development plan for Staten Island, especially regarding the growth of local businesses. Another stop on the itinerary included the United Nations. The guided tour of the UN gave them a behind-the-scenes look at the world body’s headquarters, and the opportunity to learn more about the organization’s global impact. To round out their tour of NYC, the visitors also participated in several culture tours, taking in a Mets games, a double decker bus tour, the New York Public Library, and a stop at the Top of the Rock. The two-week business study tour concluded with a ceremony where tour members received a certificate from CSI. This is the first year that CSI hosted the Liverpool Business Study Tour with LJMU. Staff members at the Center for Global Engagement hope that this tradition will continue between the two institutions in an effort to enlighten future young entrepreneurs.